Throughout the morning of Wednesday, February 20, the Gateway conference room was alive with the buzz and chatter of innovation. A cohort of inventive students gathered with members of the Derryfield community, as well as local professionals and businesspeople, to share ideas in the spirit of entrepreneurship. 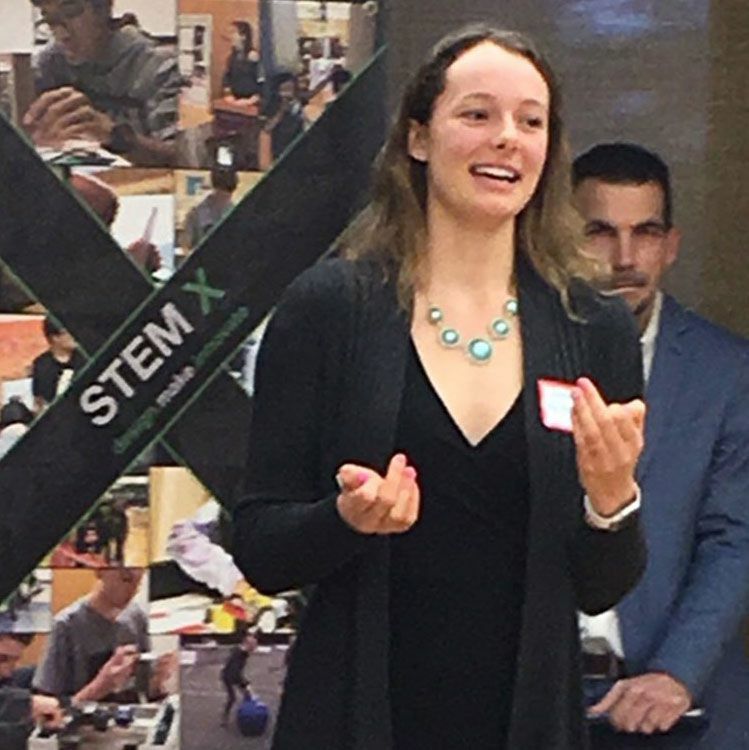 Dean of Innovation Dr. Masoni envisioned the inaugural Innovation Breakfast as an opportunity for STEM-X students to make valuable connections with adults working in their fields of interest, and it more than lived up to his expectations. Julia described her efforts to develop a cohesive program that addresses the negative effects of social media on adolescent girls’ mental health and self-esteem. She was followed by several other presenters, including Max Horton ’19, David Doan ’19 and Avry Truex ’19 on Project Tiny House; Marshal Dong on ’19 on the DS Hackathon; Max Karpawich ’19 on the Student Journalism Coalition; Emma Place ’19 on the Plastic Project ’19; and Rami Hanna ’19 on Turnafit. Each student identified a unique problem or set of problems affecting individuals or the environment, and shared their proposed solutions as well as the steps they were taking to legitimize their work. Another round of presentations followed the first networking session. Presenters included Abby Wilding ’19, Emanne Khan ’19, and Sally Mullins ’19 on Growing Hope; Emerson Bracy ’20 and Noah Gonzalez ’19 on Blossom; Cam Bishop ’19, John Anderson ’19, and Tristan Allard ’22 on Diet Shopper; Brooke Nolan ’21, Mary Tierno ’21, Chas Dean ’21, and Sander van Duren ’19 on UniBottle; and, last but certainly not least, Matt Michaud ’19, Nathan Richer ’19, and Jon MacLean ’19 on NeuroBar. These presenters also got the opportunity to network and connect with attendees. As Derryfield looks to the future of STEM-X with the construction of the new Science and Innovation Center commencing in a few short weeks, Dr. Masoni shared his intention to expand on similar opportunities to the breakfast: “events like the Innovation Breakfast are squarely aimed at generating enthusiasm about the work we are doing at Derryfield and connecting like-minded people around the core concept of challenging ourselves, both as students and as adults, to be original problem solvers who are pushing the boundaries in innovative ways.” Stay tuned for more information on the upcoming third annual Derryfield Xpo and the first-ever Derryfield Hackathon!